I got hold of The Arrival back when it was released in 2007. I knew a priori that there were no recognisable words in the book. What I wasn’t prepared for was the sheer awesomeness of the book. 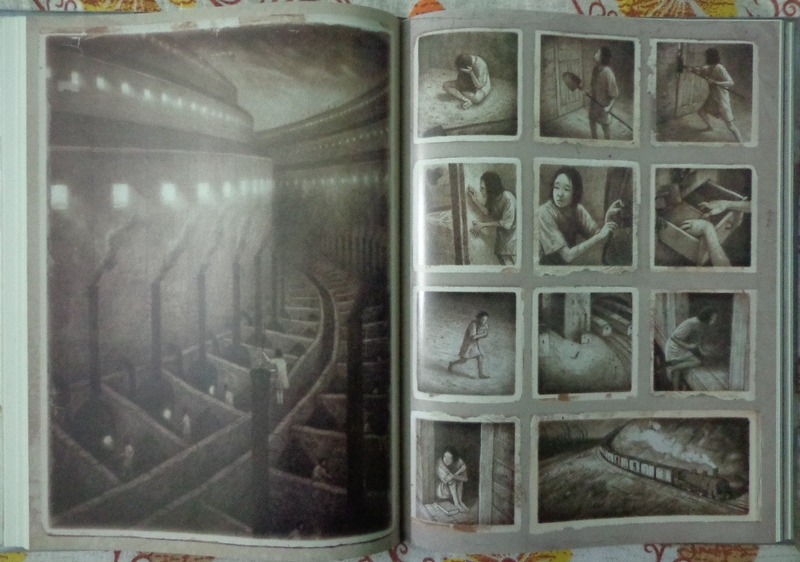 Shaun Tan was able to create something that partly pushed the boundaries of the medium itself – or to be more apt, he reinvented the classic form of graphic storytelling that has been used to adore countless houses, tombs and religious monuments since human beings existed. 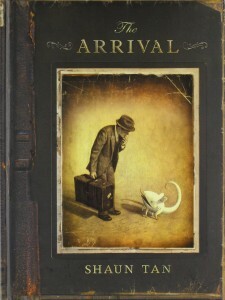 The Arrival is a gorgeous book. The artwork is almost exclusively done in pencils. 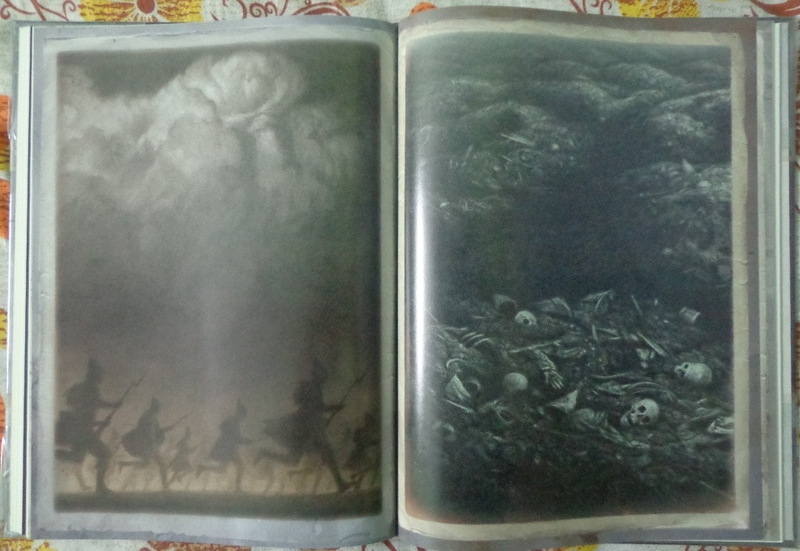 The main characters are realistically depicted, while the backgrounds borrow heavily from surrealistic paintings. The whitespace is textured to give the book an worn, yellowed, mould infested paper album feel. Shaun Tan has a knack of putting magical objects in day to day, mundane settings. This is more evident in two of his other works – The Lost Thing and Tales from the Outer Suburbia. There are many places where Mr. Tan uses small mundane snippets arranged in an order to denote passage of time. 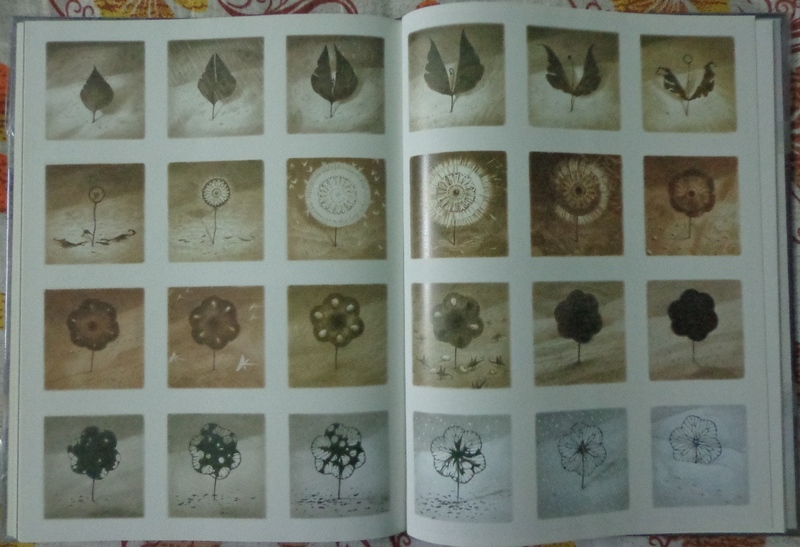 These may be clouds that the protagonist observes through the peephole of a sailing ship or the phases of an unknown plant gracing a spread. 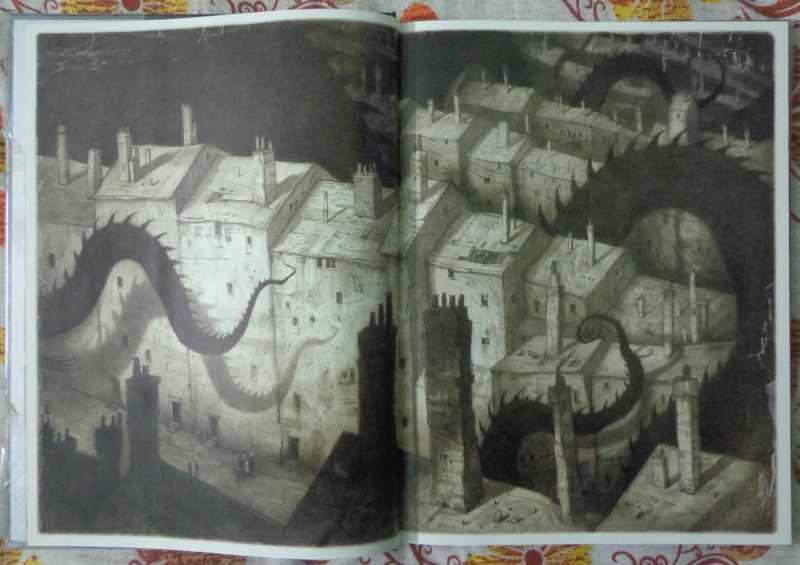 Shaun Tan also uses hues to denote the warmth or coldness of the environment. The above panel is a good example of this technique. The snow clad sceneries are devoid of sepia tones while the sepia in blazing factory scenes and hot summer border on amber. The drawings are very very detailed. But somehow, Mr. Tan has evaded the dreaded pitfall of being either explicit or exotic. This allows the reader to soak themselves in and become a part of the journey themselves. At it’s heart, the book is about immigration. 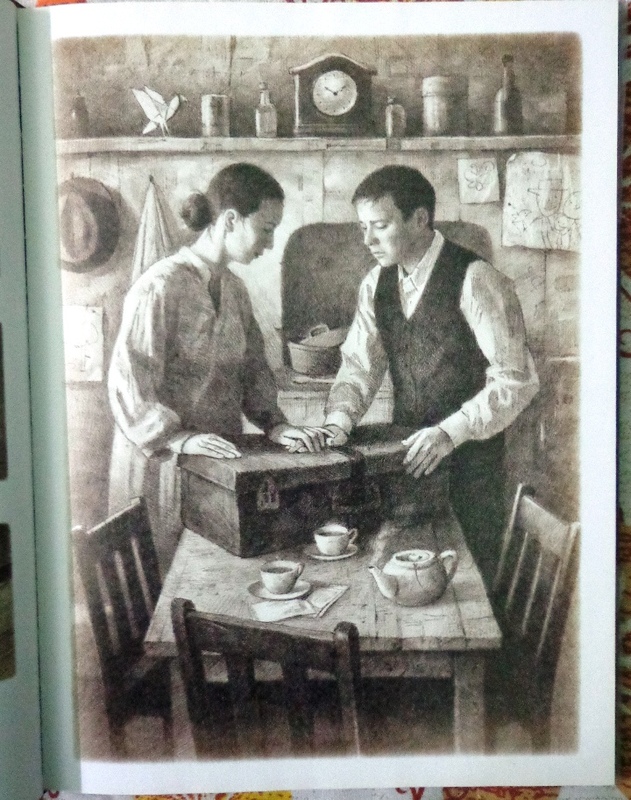 The nameless protagonist, modelled much after Mr. Tan himself, leaves his home country, his wife and his daughter to migrate to an unknown land. Through the course of the book we are introduced to the strange world around him as well as other people who had migrated to this land. The reader is exposed to the various hardships that these nameless characters have faced in their homeland and how they extend a helping hand to the protagonist in his quest to naturalise himself in an alien environment. The protagonist himself escapes a strange corrupting Dragon’s shadow that lurks in his homeland. He also interacts with a person who has escaped a Holocaust like scenario, an old person who was physically handipped by a waging war in his homeland, and a teenager who escaped slavery. While these depictions may have strong ties to real life events, the absence of words forces the reader to interprete these harrowing events with their own experience and knowledge. Mr. Tan uses an imaginary script, strange animals, unusual objects and even stranger monuments to depict the universality of feelings and interactions between human beings and their surroundings in an alien land. Mr. Tan himself admits that the migration hub has been influenced by New York of early 1900s. The reaction to huge strange statues at the port might be an indication of how the immigrants back then felt about The Statue of Liberty. The book itself has a very happy ending. 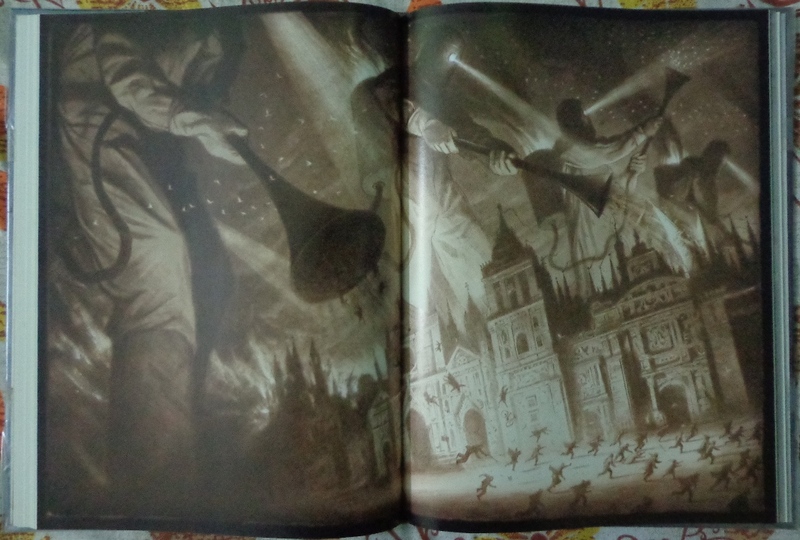 There are a few pages near the end that mirror the opening sequences. While the functionality of the objects remain the same, the objects themselves have different shapes, sizes, mechanisms, etc. The reader will note the changes in origamis (bird vs the strange pet), the vegetables, the clock mechanism, the cutlary as well as the vibe (tone, warmth, etc.) once the transition is complete. 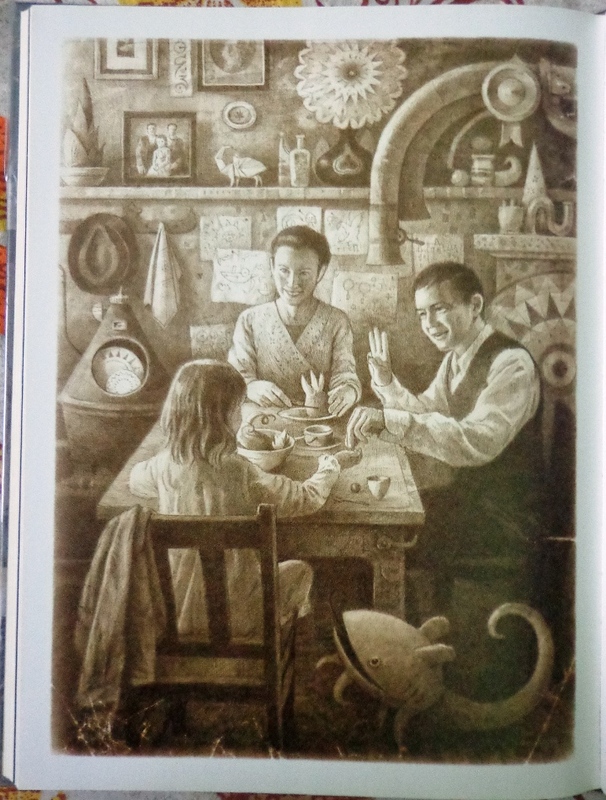 We are greeted with a much happier family in the last few pages. And just like the generousity shown by strangers to the protagonist, the girl passes on that generousity to another traveller by showing her the way. This is a great book and one of a kind. I believe that this would be a good book to introduce some young teenager to the world of graphic novels. However, that person will have to follow it up with something completely different as there is nothing like it in the market. A footnote: A very text-heavy, near academical exposition of this book can be found here. I was unable to figure out if the author was partly ditching Mr. Tan’s premise in The Arrival or was he/she just trying to project a neutral point of view. Nonetheless, the review nearly strips the art (or the book) from the background of the art (or the context) and weaves a comparative web of its premise with respect to other literary works – thereby creating a newer contextual information.